Ometeotl: Dual Generating Essence, Creator Mother & Father, “May what is Dual Unite to Create"
"May What is Dual Unite to Create" was the guiding principle that led to the formation of Ometeotl: Domestic Violence Survivors Cooperative. Guadalupe Perez made courageous choices in her journey to launch Ometeotl. More than twelve years ago, she made the courageous choice to leave her abusive ex-husband and with her two young children, Jose and Atzimba seek refuge in a domestic violence shelter in East Harlem. She and her family withstood fear of retribution, hunger, and uncertainty of what was to come. An immigrant from Mexico, limited English skills, poor job prospects, with two young children to take care of by herself, Guadalupe did not let these incredible obstacles stop her from pursuing her goals of creating a better future for her children. She searched for help and found it with Violence Intervention Project. It was at the Violence Intervention Project that she received the institutional support that she needed to divorce her husband, find permanent housing and start attending school. With a hard-earned sense of stability and growing hope, Guadalupe was able to focus on one of her passions - making jewelry out of common everyday household materials. With renewed hope and sense of purpose, she volunteered all her free time to help other survivors of domestic violence. She began to offer jewelry-making workshops at Violence Intervention Project, and it is in that experience that she saw an opportunity to evolve her work from workshops into a profitable business. Now with keen business ambition, Guadalupe looked for programs that would help her turn her hobby into a business. She wanted to start her business as a co-op because it best reflects her values on self-empowerment, fairness, and economic sustainability. She attended the first annual NYC Worker-Owners Cooperative Conference and met Omar of Green Worker Cooperatives. With laser focus and determination, Guadalupe set out to enlist her daughter and fiancé, Alan Rinaldo, to team up with her and take the 20-week journey enroll into Green Worker's Co-op Academy, in Fall 2015. Guadalupe, Alan and Atzimba graduated from Co-op Academy in February 2016. Since then they have incorporated as a cooperative, and are now working on creating a contract with high-end fashion designer Eileen Fisher, to be featured jewelry brand in their stores. 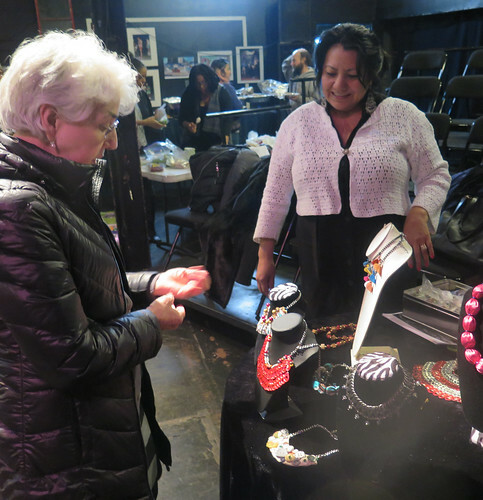 When they get the contract with Eileen Fisher, Ometeotl will be the first-ever, upcycled jewelry maker to be carried by a high-end clothing line.